We started Saturday morning off with a good warm breakfast we knew working on the dig down in the cave would wear us down fast and a good meal helps a lot. 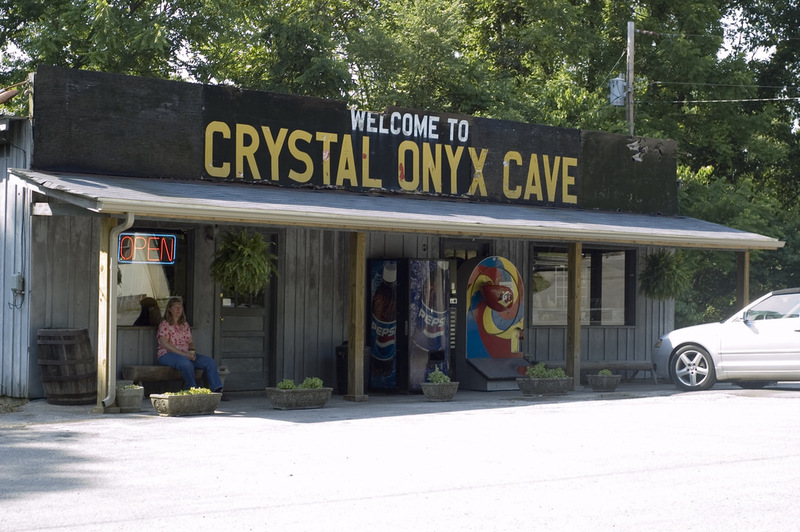 After the three of us ate, Barry, Joey, and myself headed out to Mammoth Cave Park to visit Floyd Collins grave site. He was trapped in a cave in 1927 and lost his life due to a rock that had fallen on his leg. Drove around the park for a bit and headed back to start working the dig. We started into there cave about 3:00 pm. after Barry and I put on our wet suites. I sat up the pulley system and got Joe into a seat harness to work the pulley to pull buckets of mud and rock from the hole 13 feet below. Barry and I climbed down the old wooden stairs and down into the hole. At the bottom of the hole there is a seven foot hands and knees crawl about two feet wide and two feet high, at the end of the crawl there is enough room for a small person to stand up straight. Off to the right there is a 90 degree turn to the left and up into a small room 5 foot by 4 foot. I would start moving the mud and rock from the small room above and Barry would fill buckets of mud and rock from the fractured wall and floor. We had been working about three hours when Barry called for a break. I hated to stop; I had found a ledge on the left hand wall that seemed to go under the wall. Its so hard to stop when you start! But I knew I was getting tired and I knew Barry was tiring too, and he was right we had worked hard. Its not easy filling buckets in that small crawl and getting them out to pull up on the rope. After a couple of minutes giving Barry time to clear the passage under me I started to back down from the little room. As I slid down and looked up I seen a rock about three feet above me that looked like it was ready to fall. I didn’t want it to fall on me while I passed under it. I went to pull out the rock that looked like it was sitting on a shelf and it fell! The rock MUCH bigger than it looked from below fell on top of my legs about a 50 pound rock. I yelled for Barry as the fallen rock was pinching my left leg against the wall. Barry came back in and tried to move it but it was above him and in the small passage and couldn’t be moved. He yelled for Joey to go back to the office off the Show Cave and get a jack so we could try and get it up off of my leg. The rock was laying on my leg. It wasn’t but a few seconds later and more of the wall fell on top of me. 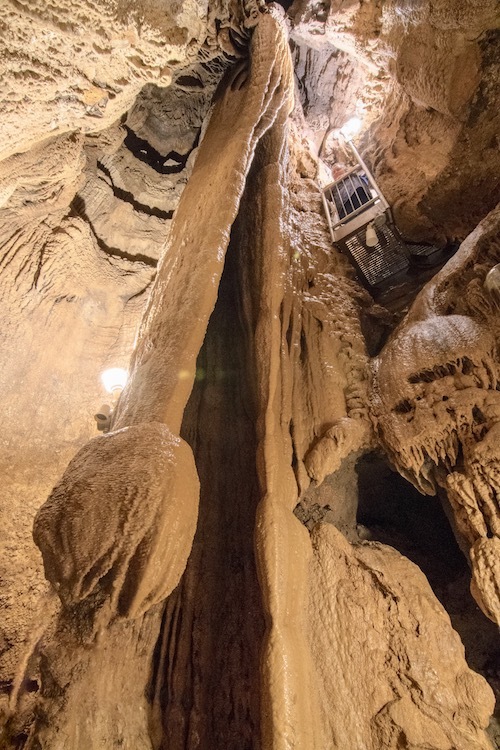 It was about a six inch layer of flow stone that had a gotten a seam of air between it and the limestone when we blew the passage a week before. And within minutes the whole wall fell as I layed and watched it come down there wasn’t anything I could do. I couldn’t move. I yelled to Barry to go get help, he was holding the rock from below trying to keep it from putting so much weight o me. But he had to go get more help. The wall had fallen and I had so much rock and mud on me all I could move was my arms. Barry didn’t want to go, he didn’t want to leave me in the hole alone, I could hear it in his voice he was as scared as I was. There was no choice he had to go get more help by now just a jack was useless. I needed a rescue. It was now an entrapment. I could hear Barry running up the wooden stairs and then lost all sound there was nothing. I could feel the rock on my left leg pushing on the wall, my right leg was buried under thew rock and had twisted under me when everything fell. It was killing me. But I couldn’t move it at all, at least the one pinned to the wall I could move my foot and toes. I have been on rescues before “not mine” and I knew how long it takes to get help together. It takes a long time. I knew Tracers would be called and some of them are close friends of mine, even though I didn’t want them to bet called I knew deep down that would be the best thing to do. I could hear someone coming down the stairs from above. It was Barry, I was so happy to see him back. It seemed like I was there for a long time by myself. He cave back down into the hole and we talked. I’m not sure what we said though. I remember getting a cramp in my leg and I let out a scream I couldn’t move it my God I was starting to hurt all over. From Barry’s side of the passage all you could see was my left knee down, if you looked up through some of the rocks on the left hand side of the wall you could see my face. Barry stayed down there and Karen came down to see if there was anything she could do or help me with. They wanted to know what my favorite song was and I said “When the walls come down” by Carley Simon.. that is my favorite song… and they just laughed. I guess Ed came down in the hole too but I don’t remember him being there. I’m not real sure what happened from time to time, seems my memory slipped a bit down in that cold dark hole. Or maybe the pain was just getting so bad from having all the weight of the rock on me and my leg being pinned on the wall I blocked some things out. I guess I will never know. I know my right leg had gone to sleep and I didn’t feel it anymore at the time that was fine. I needed some kind of release. I kept asking when someone was coming I was hurting all over all I wanted was out from under the rock. I couldn’t help but wonder if on the other side of this breakdown mess if anyone heard me cry. Barry told me that Chris and Jason my friends from Tracers had arrived. I heard Chris’s voice and seen his light through the hole. He looked things over and asked how I was doing. He said more people would be there shortly and together they would access the situation and see what would be the best way to remove the rock. He tried to take my pulse but I was covered with too much mud and he didn’t have very good access to me. I remember him trying to dig out some mud so the rock would move off my leg a bit, but it shifted and put more pressure on me. He tried to keep me calm by singing to me and talking I guess it worked. I was getting tired my body had stopped shaking and it would have been so easy to go to sleep I remember that. But I didn’t go to sleep and waited what seemed like forever for everyone to get there. At some point they did. Rescue workers took turns crawling to the breakdown to look at what had fallen and to see what could be done. After about two hours and talks about jack hammers, sledge hammers jaws of life and I am not sure what else so they could break the rock pinning my left leg on the wall, they decided to keep me busy and moving by moving mud and small rock through the hole on the left hand side. With me passing mud and small rock through the hole on the left, and Tracers and the Fire Dept. moving rock from below and after about 4 hours Chris climbed over me and held back a large rock the was leaning on my shoulders and neck the whole time, so they could pull me out from below. After that point I know I walked out of the cave with someone holding me on each side and they took me to the showers to get my core temp back up. The showers was the first time I seem my son and Barry again after what seemed like forever. it was a long night, one I am glad is over and I am glad I had good friends beside me through out it all. All I received was bruises from my chest down and a almost too low body temp. I hurt for a few days after but I still have that need to back and see what we found. Theres something in that hole dow there I know it and I will find it no matter what. Goliath, at the bottom of the cave where she was trapped. 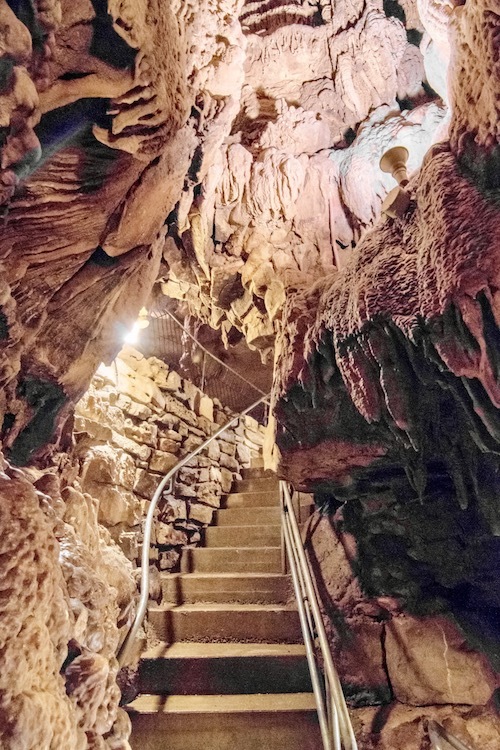 New stairs to the bottom of the cave. 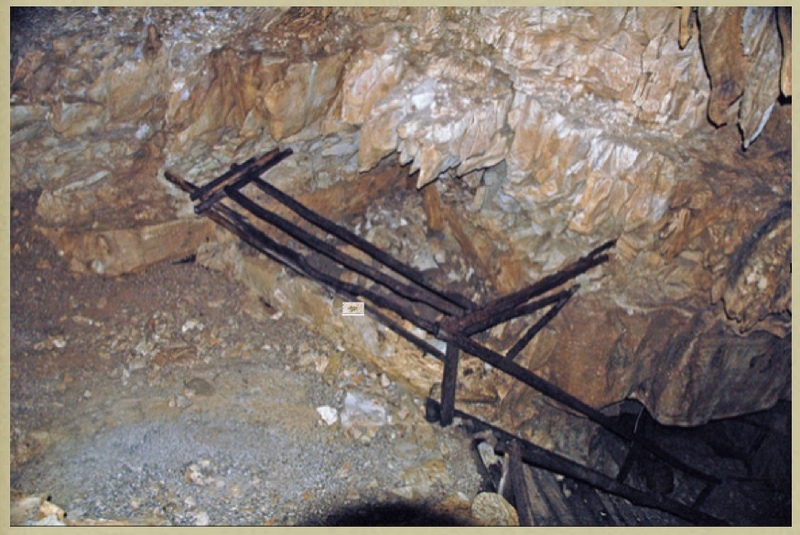 Old stairs to the bottom of the cave where Shelly Wolf was trapped.